When I was a little girl my mom shared a story about a friend who had fresh flowers delivered to her home on a regular basis. She was rather well off and her home was her haven, so she would drop several containers off at the florist each week and they would return them to her brimming with color. I always thought that was the coolest thing. Now that I'm a big girl and I own my own home, I have flowers in every room, every week, too. And I'm no millionaire. There are plenty of cheap and easy ways to decorate with flowers and real or not, they all add something very special to the spaces they're added. 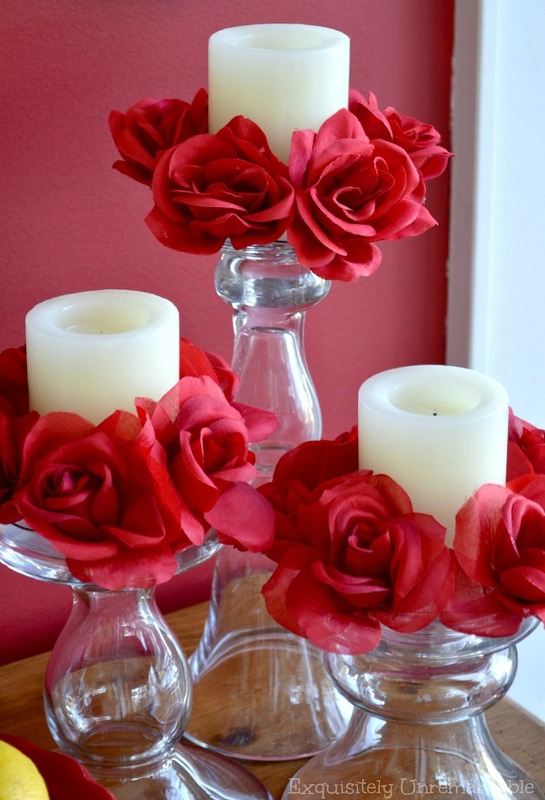 Let's start with some faux flower ideas, shall we? Now, I know I've stated that I'm not a huge fan of fake, but let's face it, they do have their place. 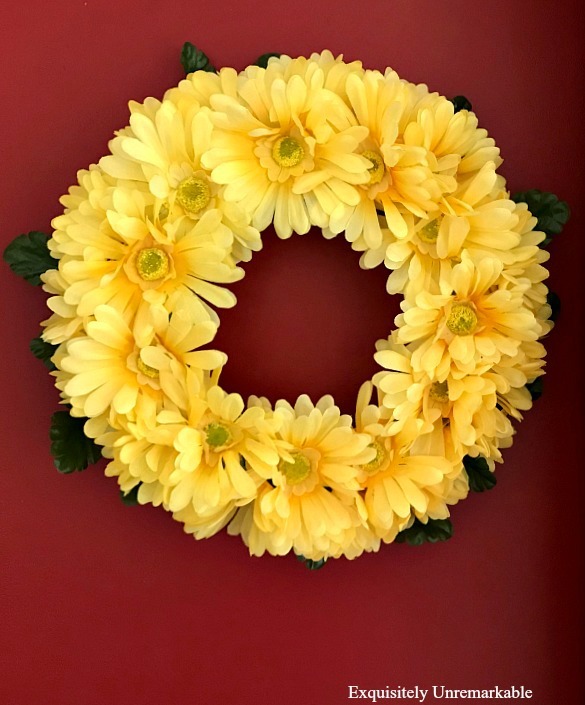 Until there's a cut flower that will last for over a month or a they make a cupcake wreath that will keep, they are the best option for crafts. I usually hit the dollar store first, because...well, the flowers are a dollar...and for that dollar you get a pretty substantial stem of blooms and they always have a wide selection that changes with the seasons. If I need something very specific, I go to the hobby store with that 40% off coupon in hand. Then I grab my glue gun and get crafty. This is one of my favorites. 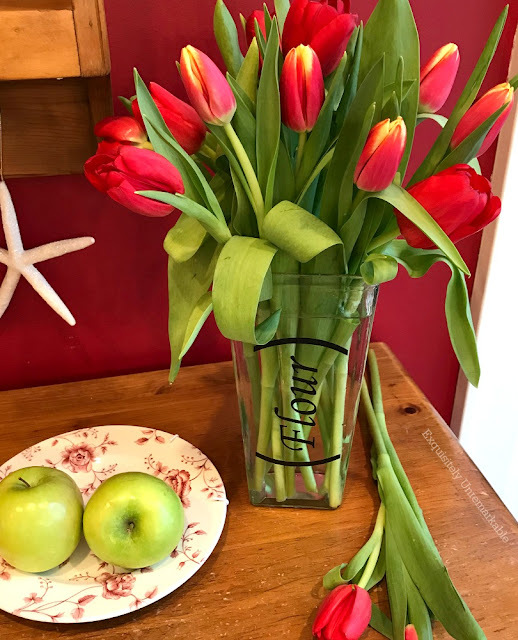 I used my kids' old rain boot and stuffed it with some tulips. It was a fabulous way to welcome spring and I was able to display a keepsake that reminded me of the "little" days. Whimsical and sentimental. I've also put cut flowers in boots. Go check it out. These rings started out as a triple wreath for Valentine's Day, but on a whim I dressed the candles with them and I fell in love with the look. Cupid's magic I suppose. It's a super simple DIY and much less expensive than buying them pre-made rings...IF you can find them at all. It was a very long winter and a very rainy spring. When it was clear that Mother Nature was not going to provide the sunshine, I made my own. Tracking these flowers down was the most difficult part of the project...what a run around. Yikes. Of course, when I am looking for real burst of color, nothing beats a cut bunch of flowers. They bring life into a room, brighten the space and add a little romance and decadence into an otherwise ordinary area. What kind of flowers? How should you display them? Well, that's up to you, but here are a few ideas for inspiration. Tulips are my all time favorite flower. They define casual elegance, sweet, simple and if you pick them up at the grocery store, you can get a few bunches for under $10. 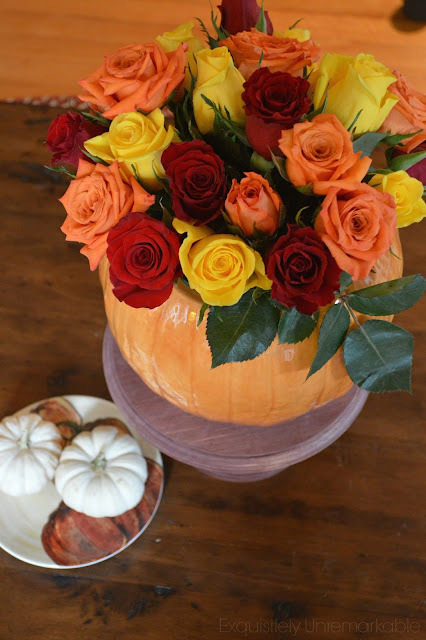 Check out my tips on how to make them last longer and what color is the heartiest in the vase. Several years ago, I popped some roses into an old cookie jar and fell in love with the results. This trick works with any kind of cookie jar for any season or occasion....and with any flower you choose. Pick one up at the thrift store and the jar and bouquet will certainly come in under $10. Glass vases are plentiful at second hand shops and they are always, always cheap. Of course, they're usually pretty boring, too...but you can change all that with a simple vinyl decal. 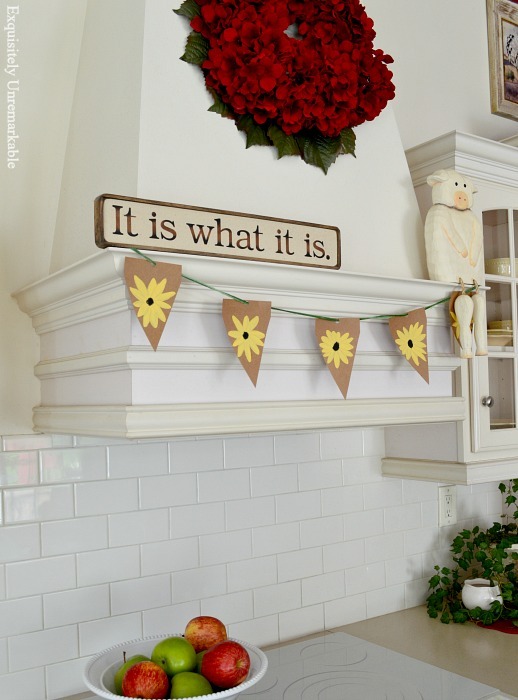 Slap on a serious sentiment or a whimsical word and you have a unique decor piece for a bargain price. And perhaps a good laugh, too. These recycled tea tins are another example of cuteness that lured me to the dark side. I just had to put some flowers inside them. Poor little pansies. Luckily everyone is still blooming. I think that may be a record. And a good reason to drink more of this delicious tea. Of course no round up would be complete without one of my beloved banners. This one was hand painted with a technique I used to use with my kindergarteners. So easy...and you can customize the colors to match your decor. Best of all, it's under ten bucks and even I can't kill a painting!! 😉 Win, win! My goodness, that was a whole lot of flowers, but since there's no such thing as too many blooms, I know you'll love a few more pretty posts from my friends. Best of all, they're all under ten dollars from my Ten On The Tenth gals. 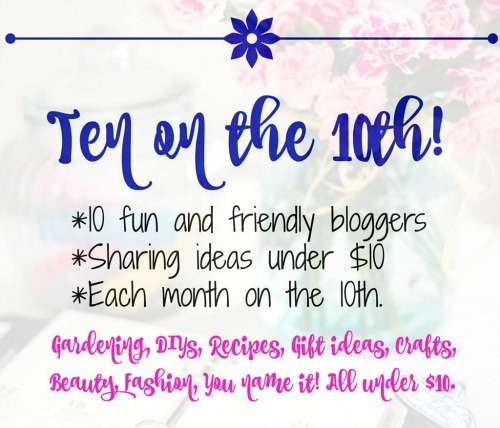 It's when we share all sorts of fun ideas for under $10 on the 10th of each month. How fabulous! You are quite clever!! 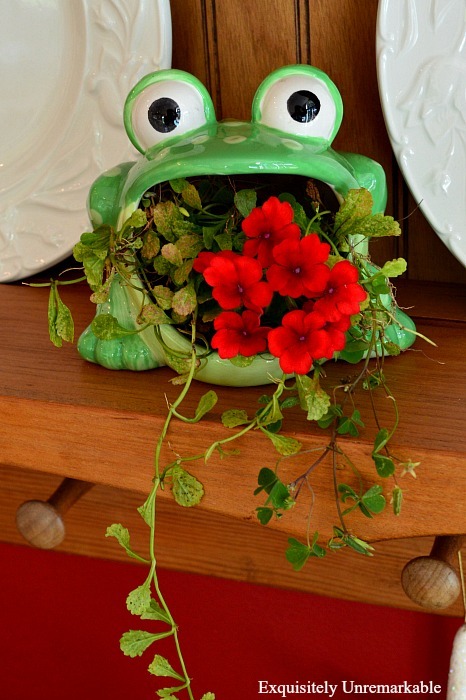 The frog made me smile, that idea is very unique!! 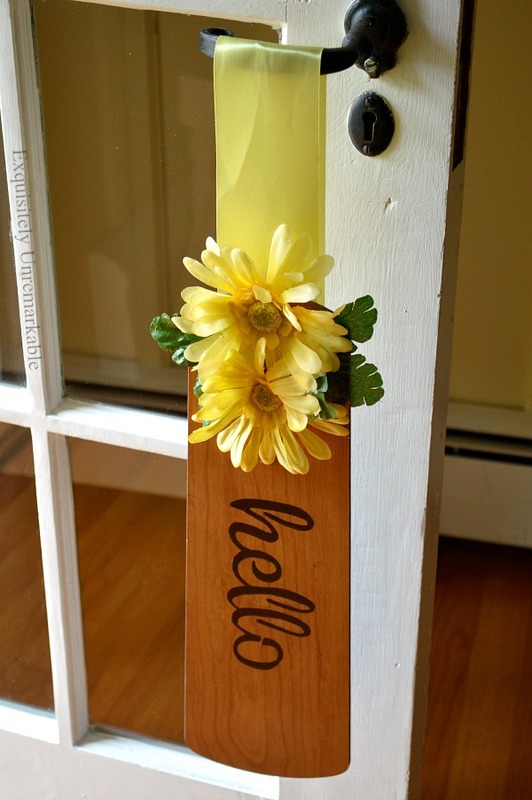 Also love the idea of the hello paddle from the fan blade! Thanks so much, Patti! Live plants are dicey prospect for me, but I think they have a better shot of making it in a cute container! Kim, these are all super ideas. 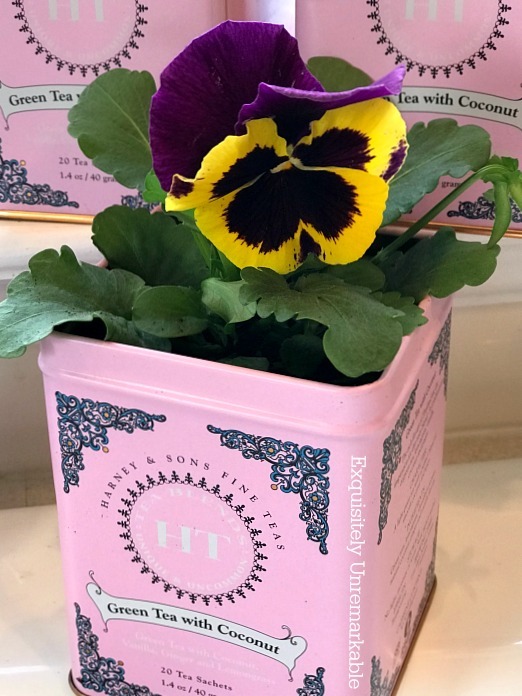 The tulips in the boot and the pansy in the tin are my favorites. I do think you have a knack for using faux flowers that make them seem less "fake". Perhaps it's because you don't just throw them in a vase or basket and call it good. You take the time to be creative with them. I like that. Have a sunny, flowery Sunday, my friend. Hugs. Thanks so much, Nancy!! Growing up I saw plenty of those fake flowers in a vase and they always made me sneeze. I think I am more offended by the dust than the look. I think they gather less when hung! I appreciate the sweet words and hope you have a flower filled da,y as well! Hugs! I think my favorite is still the tea container! Flowers make everything better. Thanks Lisa! Considering those tea tins were free, they'r my favorite, too!! All pretty ideas Kim. I just bought a cute new pair of kid size garden boots that I am going to stuff full of flowers. Have a great Sunday. Great ideas. Dollar Tree has some great faux flowers sometimes. Faux are a great way to go but I like fresh the best too. You are so creative! Not sure which one I love more or want to start first! It's a toss up between the adorable rain boots and the fan blade. So stinkin cute! Thanks for sharing you fun ideas. You are so right, there is nothing like beautiful flowers in your home! Such beautiful ideas as always. Thank you so much, Tammy!! You are super sweet. I remember many of these Kim & I'm like you...my fave will always be the one with the rain boots. I don't think I've seen the red ones on the glass candle holder yet, but like that one too. Good job with your round up. Kim, thanks *so* much for the cookie jar idea! I have an antique white cookie jar of a rocking horse. Most of the painted details have worn off it, but it would come to life with a couple of colorful store-bought bunches of wildflowers in it. The top is the horse's head, reins, and back and I'd just lay it on the diningroom table in front of the jar. This will be a splurge for me, but entirely worth it. Thank you for making my day! Cindy, you just totally made MY day!! 😍 This is exactly why I share...in the hopes that others may find some inspiration to use in their own homes. Your idea sounds fabulous and I just know it will be beautiful. I would definitely check the grocery store for cheap bouquets or better yet, with everything in bloom, you may have something appropriate in your garden or in a generous neighbor's. Thanks so much for taking the time to comment and I hope you have a wonderful afternoon! These are such great projects, Kim! Flowers in the house are a must, faux or real! Thanks so much, Deanna! And I totally agree! Oh this was such fun! The frog just makes me smile and I can never get enough of the Tea Tins! Thanks so much, Jemma! I'm pretty smitten with that frog, too. I originally thought I paid to much for him, but I think I've certainly gotten my smile's worth! All these ideas are perfect for me who can look at flowers but cannot touch them for fear they will wilt. I am all for flower crafts if it keeps my home pretty and full of color. Mary, I am right there with you, I am no friend to the flowers. I try hard, I really do, but somehow it's always a giant fail.. 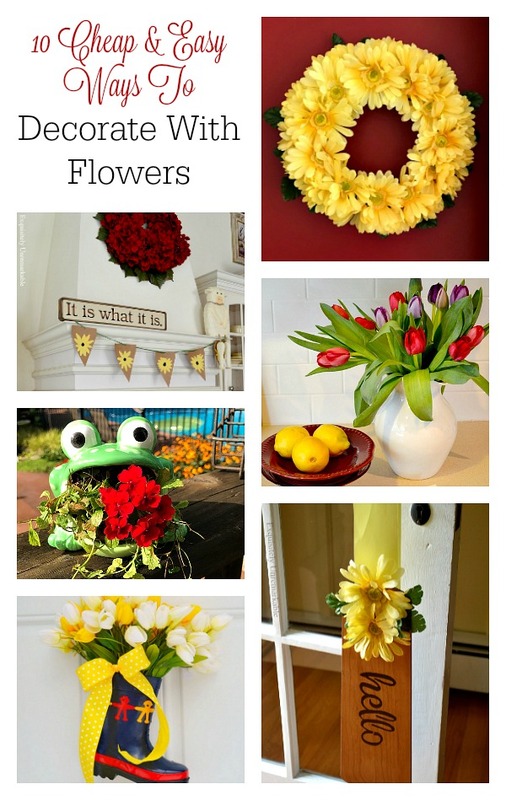 So many pretty ideas for flowers! Love them all. Flowers are always a nice addition to decor, whether they are real or faux. Pretty little projects Kim. These are some adorable ideas, Kim! I do a mix of real and faux flowers (and plants) around our home, depending on the season. About the only "real" things growing here right now are Vincas and potato plants, but both are much better suited to the great outdoors. We are soon to get a Trader Joe's close to us, and it's my favorite place to buy fresh cut flowers....they always have great prices. 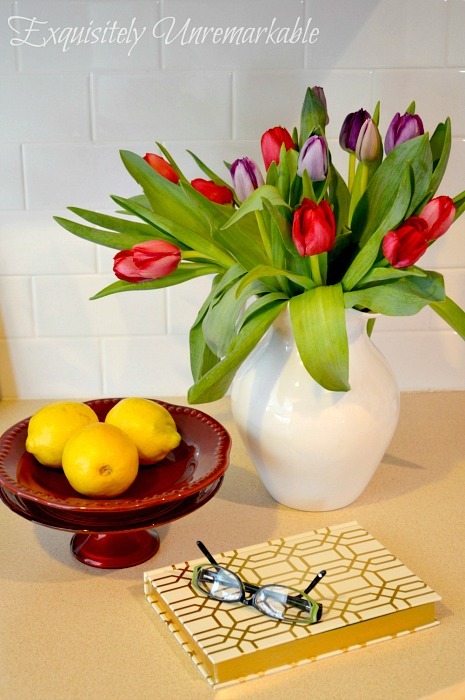 So, fresh or faux, flowers add so much to a home. I just think flowers add so much to a home, Carol, both inside and out. In the winter months I need them to for cheer and color, in the summer months, the house looks naked without them. Since I am a terrible plant mother, cut and faux work well for me. And I've never bought flowers at Trader Joe's but I've heard their selection and prices are fabulous. Enjoy! All great idea, Kim! Fresh or faux, I love to have something floral in every room! Flowers are fabulous, Cecilia!! No room is complete without them. Faux or fresh, I don't care, flowers just make everything look better. 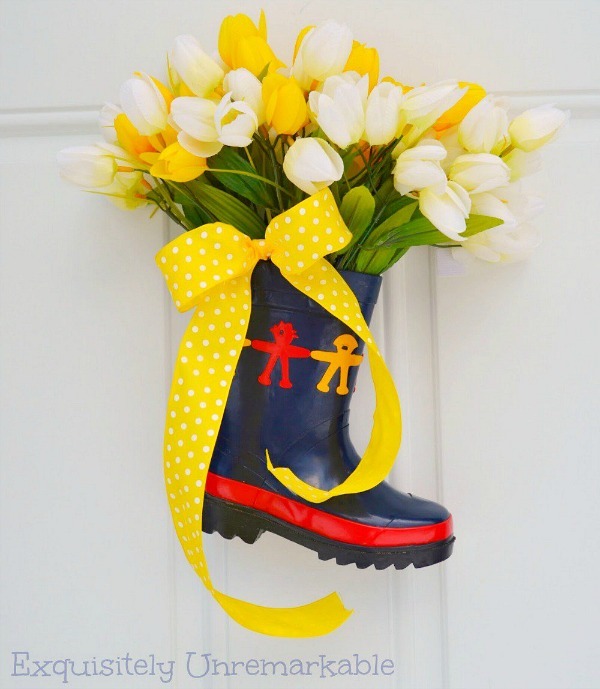 Love the tulips inthe little rain boots and that frog is still the cutest thing ever. I still love that frog, too, Michelle!! He's a cutie. Loving the flowers . . . I will never ever stop loving flowers in my midst . . . I prefer real . . . Especially walking through the yard, scissors in hand! I like a bouquet of fresh greens too . . . Sounds dreamy, Lynne! I adore doing the same thing. Nothing better than a bouquet grown at home. Makes me feel like a real farm girl. Great ideas! Love the froggy....they fly out of my shop whenever I find them! Now there is a new way to use them! They are so cute, it's easy to see why you can't keep them around. Rrrbit!! The frog is my favorite, Amalia! I highly recommend getting one...and I know you would have a super story to tell about him, too! Super ideas here, thank you. I like that frog....super cute and amusing. I use fake flowers a lot and just change them up with the season. Thanks so much, Ronda! That from makes me smile every time I peek his way.